1. 37% respondents say it's much more convenient to watch DVD movies on TV and Projector Screen via USB. 2. 21% participants choose to rip DVD to USB flash drive just because USB is small and light-weight, easy to carry when they go out for a trip. 3. Among them, 18% interviewees regard it as a primary choice to share DVD content to another computer. 4. Some can't empty enough room to save numerous discs. So they'd like to copy DVD disc to USB for backup and management. They account for 15% of the total. 5. The rest insists that it's better to protect their DVDs from physical damages. They just need plug in USB to play DVDs instead of inserting disc each time. As for unprotected DVDs, it's easy for you to directly copy ISO image or DVD Folder to USB drive via copy-and-paste method. However, when it comes to copyright protected DVDs, you can't make it happen unless you remove DVD copyright protection first with a DVD decrypter. What's more, the general file size of a DVD disc is between 4.7GB and 8.5GB. If you don't rip DVD to MP4, MKV, AVI, MOV, VOB, etc. digital formats, it's definitely burdensome for your USB flash drive to contain so large DVD files, let alone your whole DVD library with hundreds or thousands discs. Hence, to transfer DVD to USB flash drive with as many movies as possible, you need a DVD decrypter yet ripper. 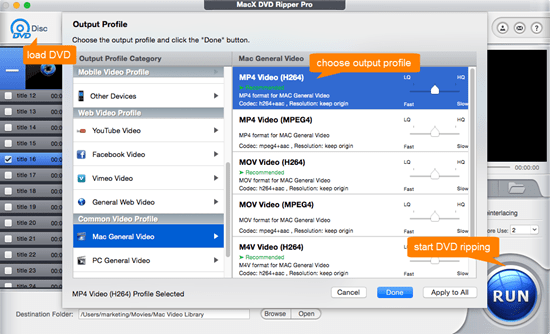 MacX DVD Ripper Pro cuts the buck. ▶ 5 mins to rip full DVDs, no matter latest protected DVDs, 99-title DVDs, Disney/Sony/Lionsgate DVD, or damaged/unplayable DVD, workout/AV DVD, etc. ▶ One click to rip DVD disc to USB, MKV, MP4, VOB, MOV, AVI, etc. and cut off the unnecessary clips, commercial ads to compress a 8GB DVD movie to 800MB. ▶ With High Quality Engine tech, it rips DVD to digital with 98% quality kept and copy DVD to ISO image/MPEG-2 file with 100% original quality. ▶ Support you to rip DVD to iPhone, iPad, iTunes, iMovie, Android, Microsoft, game console, 350+ profiles just in case your USB drive is full or goes wrong. Free download this DVD to USB ripper on Mac (macOS High Sierra and earlier) or Windows version (Windows 10/8/7/XP all supported). Then launch it and insert DVD disc via "DVD Disc" button. Select MP4 Video (H264) from "Mac General Video" as output format, since MP4 is one of the most widely used video format, supported by almost any device. You can also consider to 1:1 copy DVD to hard drive with MPEG-2, ISO image format. Only one drawback is that the file size will be much larger than MP4 format. Click "RUN" button and this Mac DVD ripper will begin to rip DVD to MP4 format at speed of 250-320FPS, 2X faster than Handbrake, all thanks to the Intel QSV hardware encoder and multi-core CPU utility. And you can also properly assign CPU cores to different tasks, like 4 cores for DVD ripping, and the rest 2 cores for website browsing, music playback, etc. 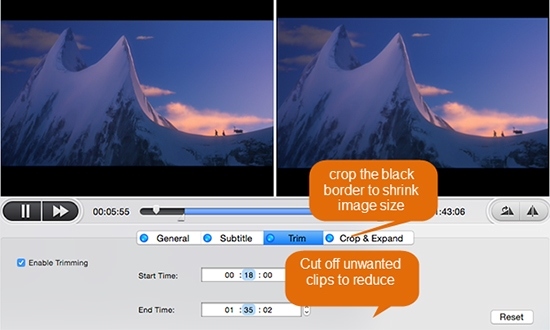 Tip: Beyond reducing DVD file size via DVD decoding and encoding, you can also further compress DVD file size using its Trim & Crop features to cut off unwanted movie clips, commercial ads from DVD movies and crop the black border to shrink output picture size, no worries about quality loss. After the DVD ripping is finished, you can eventually transfer DVD to USB drive with digital format to playback on TV, Projector Screen or another computer. Yet, one thing to remind you is that you're only allowed to use this DVD ripper for Mac to rip DVD for personal legal use. Do NOT use the ripped copies for any piracy, commercial purposes or illegal activities. There is a case: when you plan to copy DVD disc to USB flash drive to watch on TV, you regrettably find that your DVD disc has already deeply damaged by your naughty kids. Depressed? Don't be! It's totally not a problem if you rip DVD and upload DVD to cloud for backup before. Thus, you become the lucky dog, needless to re-purchase a DVD disc. Instead, you can just copy DVD to USB hard drive from cloud. How to do it? Here takes VUDU for instance. Considering there are countless cloud storage services like Apple iCloud, Amazon Cloud Drive, DropBox, VUDU, etc., so it's unrealistic to list out all the tutorials. Here we choose VUDU as an example because VUDU combines Disc to Digital feature with DVD to cloud storage feature. It has much closer relationship with DVD conversion and storage. And the method of transferring DVD to USB from cloud can also apply to other cloud storage services. It's much of muchness. Now, let's back on track to see the detailed steps. 1. 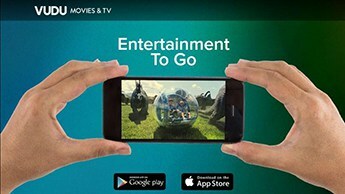 Free download the VUDU To Go application on computer (No Mac version). 2. Open VUDU app on your PC and select "Manage Download" from the Movie Details page for the movie you wanna download. 3. Select "Add SD for Download" or you can also choose HD or HDX for download. 4. Select "Manage Download" from the Movie Details page to adjust the movie download queue if you have multiple DVD movies to download. 5. Select "1: Start SD/HD/HDX Now" on the first movie you wanna download. Your DVD movie will be downloaded and saved on your computer hard disk. You open your hard disk to find the DVD movie and then transfer DVD movie to USB for TV playback. In this world, the unexpected waits around every turn. When you rip and transfer DVD to USB drive, but your USB tells you "Storage Almost Full". What if you have no USB backup and indeed need to transfer the whole DVD disc to USB? In such urgent case, you can use your iPhone iPad iPod as USB drive to store DVD movies. 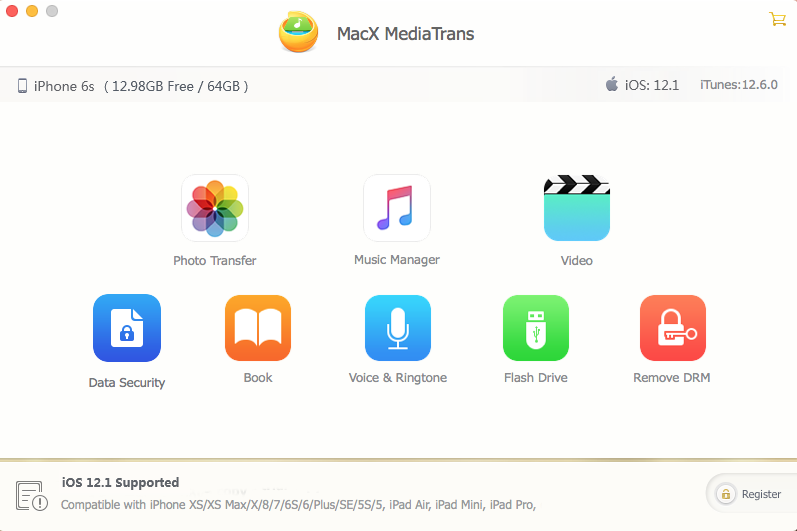 And MacX MediaTrans is just the tool to mount your iPhone iPad iPod as a USB flash drive to store DVD movies, as well as any other files like photos, music, ringtones, PDF, Excel, word text, etc. as long as your iOS device has extra space (16 iOS Device excluded). The whole DVD to iDevice transfer procedure will not use iTunes, but at the very begining, it needs iTunes to detect your iOS devices. So you're still required to update your iTunes 12.6. This iPad file transfer tool supports all iPad iPhone iPod devices with iOS 7/8/9/10. Launch this iPhone iOS mounter and then connect your iOS device to computer via USB cable. Step 2: Click "Flash Drive"
When you enter the main interface, click "Flash Drive" icon to switch to iPod iPad iPhone to USB mounting window. Now, your iPhone iOS device becomes a portable hard drive. As you can see, you can also use this iOS file manager to transfer photos, music, video, ringtones, eBooks, Podcast, etc. between iPhone iPad iPod and computer. Click "Add" button to import DVD movies. Then the DVD movies are transferred to your iPhone USB flash drive. When you open your iPhone iOS device, you can't find the DVD movies thereon. Only when you connect iPhone iOS device to computer, the saved DVD files can be listed out. MacX DVD Ripper Pro - professional DVD ripper to rip and copy DVD to USB drive with MP4, MOV, MKV, AVI, FLV, VOB, MPEG-2 and more with 98% quality Kept. 5 Mins to rip a full DVD to USB!